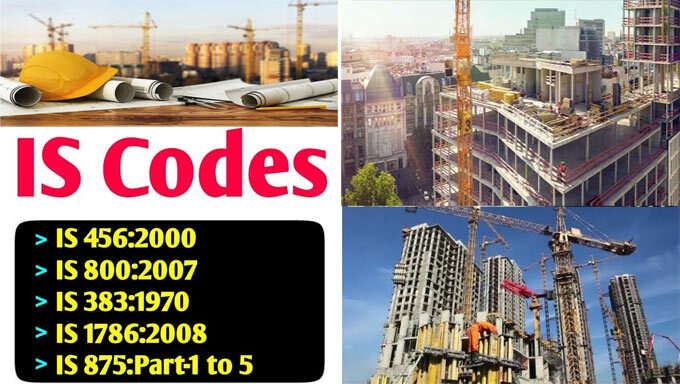 In this construction video tutorial, you will be familiar with some crucial IS codes which are necessary while making design for building structure. IS 456 : 2000 - It is an Indian Standard code of practice for general structural application of plain and reinforced concrete. This code employs the limit state design approach and working stress design approach. It provides comprehensive information on the different aspects of concrete. Basic information on mineral admixtures, aggregates, reinforcement water and admixtures. Get information on the strength of construction materials, properties, behavior, testing and inspection for workmanship. Get details on concrete design process, acting loads and forces, fire resistances, bending moment shear forces, reinforcement and various types of structure specifications related to RCC, design criteria for beam, column and slab etc. IS Code 800 : 2007 - It is the standard code of practice for general construction in steel. The standard offers the guidelines for structural design in steel. It comprises of 17 sections. It focuses on the limit stress method (required for designing beam and slab). The standard is expected to enhance the partial safety factors, fabrication factors, gross capacity and net capacity of steel structures. IS Code 383 : 1970 - It is the specification (testing, size etc.) for the coarse and fine aggregates for concrete from natural sources. It shows the quality of aggregates relating to all important tests like impact abrasion and soundness. Size and grading of aggregates, sampling and testing. IS Code 1786 : 2000 - This standard encompasses the requirements of high strength deformed steel bars and wires to be applied as reinforcement in concrete, in the following strength grades: a) Fe415, Fe 415D; b) Fe 500, Fe 500D; c) Fe 550, Fe 550D; and d) Fe 600. The code includes the guidelines for the manufacturers to provide the quality and enduring steel bars and wires with the method of hot rolling. This standard is also applicable to reinforcing bars and wires delivered in coil form but the requirements of this Indian Standard is employed to the straightened product. This code comprises of 5 parts which are applicable to the loads ranging from imposed, dead, wind, snow as well as special loads devoid of the earthquake for the building and structures. It is useful to create safe design for high-rise buildings.